Well, well, well, what has R.M. Wilburn created here? Although her book, The Rescuer’s Tale, is the second in a series - Mary Morgan’s Journal - the elements of my incredulous (as in knocked my socks off) observations must have found their genesis in volume one. Is this a mystery? A satire? An adventure? A puzzle? An incredible delight? Yes, yes, yes, yes, and most assuredly, YES! At heart, this is a detective story, and presumably one might well believe it is intended for the young, and maybe even-younger, adult; perhaps even for some precocious child, but this old man hereby claims it for himself. Two things will astound you when delving into The Rescuer’s Tale by R.M. Wilburn. First, each page reveals a deeply intriguing collage of absolutely gorgeous, monstrously creative illustrations by the author. These images, purely artistic in themselves, lead the reader’s eye through an inclusive dialogue-of-words as if he is rummaging through a detective’s comprehensive file, making him feel like he alone in discovering all these mysterious clues, putting together improbable scenarios, and coming to his ultimate conclusions with no outside help. This evokes the sensation of non-linear reading, and such has never been more pleasing or accessible. Second, content does unfold quite story-like, despite the seeming hodge-podge, for this apparent randomness of images is entirely strategic. The story may be fantastical, including sci-fi elements and Harry Potterish magic, but it is also ripe with contemporary politics (a recently ousted leader named Herr Bigly Rump bears too many familiar and thoroughly nasty traits), making the attached newspaper clippings deliciously relevant and timely. Final word: The Rescuer’s Tale is Uncommonly Smart & Unbelievably Creative. The Rescuer's Tale: Mary Morgan's Journal, Book 2 is a dystopian graphic novel written and illustrated by R.M. Wilburn. While this is book 2 in her series, it can be read as a standalone. The Great Orange Beast, Herr Bigly Rump, is no longer in power, but all is still not well in the world. He was supplanted through the connivance of his own supporters, and another vile profiteer, Sir Dastardly Gott, was installed in his place. Mary had been in the forefront of those investigating the multitudinous misdeeds of Herr Rump, but she was appalled to discover that Sir Gott was one of the miscreants responsible for the fate of Magistrate Parsimonious Creed, Mary’s missing mentor and friend. She still hoped that he was somehow, miraculously, still alive, but her attention was also squarely focused on Magistrate Gott’s decision to release any prisoners from the Arctic Mines who had children currently being fostered or in orphanages. Why would Gott commit an act of mercy, she wondered. There had to be something base and self-serving here, and she would ferret it out. The Rescuer's Tale places the reader in a nightmarish alternate reality which is far too similar to our own current predicament for comfort. Wilburn’s Mary Morgan is a classic hero in the best sense, one who faces all manner of perils in her efforts to restore some modicum of sanity to her world. Wilburn’s story is dark, yet pervaded by a sense of optimism, of hope for a better future, even if the challenges are great. Her illustrations are marvelous. The hand-written entries appearing on stained and deckle-edged scraps of paper give an authentic feel to the plot and make the severity of the situation seem real. The drawings of the Arctic Mines are inspired, and the portraits of her characters, particularly the lost and legendary Parsimonious Creed, draw the reader ever more deeply into the plight of a world sadly not all that far removed from our own. The Rescuer's Tale: Mary Morgan's Journal, Book 2 is most highly recommended. The Rescuer’s Tale is a fiction graphic novel penned and illustrated by author R.M. Wilburn, and is the second novel in the Mary Morgan’s Journal series, following The Cautioner’s Tale. In this second tale in the life of young investigator Mary Morgan, she once again faces a magistrate as her enemy, this time Sir Dastardly Gott, falling prey to another quest to eradicate her and her meddling ways. Mary’s determination to bring down the regime is hampered a little by the twist of public opinion, as people start to believe she herself might be responsible for the previous magistrate’s disappearance. But Mary is about to uncover a whole slew of other missing people: those that can really bring the revolution alive if she can find them. I thoroughly enjoyed this adventure, which I think would be suitable for middle grade readers and up to enjoy because of its lush visual quality. Adults and YA readers are sure to get a lot out of the strong political bent of the plot and Mary’s desire for escape and the overthrow of the current regime in Wilburn’s vivid make-believe world. The art quality was both dark and adorable, combining some real Indiana Jones type investigative themes with both D&D vibes and Sherlock Holmes! The genre-bending graphic work of The Rescuer’s Tale is not to be missed, and R.M. Wilburn has produced a fully realized and satisfying story with realistic characters, clever plot lines and cohesive, interactive artwork that brings it all to life. Prepare yourselves, brave readers, for a reading experience like no other. The Rescuer's Tale by R.M. Wilburn is a colorful and imaginative graphic novel for young readers who are just as colorful and imaginative. The Rescuer's Tale chronicles the life and times of Mary Morgan who is a bit of a renegade puzzle solver. 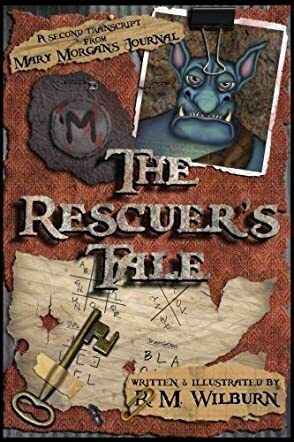 The Rescuer's Tale is the second book in the Mary Morgan's Journal series, and the story picks up after the first book with Mary at the ready to rescue her friends, Juggler Vein and Parsimonious Creed. Of course, Mary's world is far from saved. Especially with the new big baddy, Sir Dastardly Gott, on the horizon. Reading The Rescuer's Tale filled me with such childhood nostalgia. The names and titles Wilburn gives certain people or groups of people drew me back to the days of Artemis Fowl, Harry Potter, and The City of Ember. It is truly a fantasy and the graphic art aspect just cements Wilburn's vision. The wonderful illustrations will certainly lure and immerse readers in Mary Morgan's world. I found myself smiling like a little kid while I read. From the point of view of an adult, I can identify with the subliminal context. In some ways, the things happening in Mary Morgan's world have, at some point, happened in ours recently and even long ago, albeit in a less magical way. This does not mar or change my views on how sublime I believe R.M. Wilburn's work to be. I honestly hope The Rescuer's Tale finds its way in the hands of many young readers because, at its core, the Mary Morgan series is inventive and fun. R.M. Wilburn returns with The Rescuer's Tale, the second installment in the Mary Morgan's Journal series. After nearly two chaotic years of tyranny, Magistrate Herr Bigly Rump has been impeached and replaced by Sir Dastardly Gott, another self-serving billionaire and former Chief of the Federal Bureau of Instigation. Just like his predecessor, he’s hell-bent on finding young investigator and former colleague of Dr. Parsimonious Creed in hiding, Mary Morgan. With conspiracy theorists blaming Mary for the Rump’s absence, she braves spy bots, drones, and super soldiers to rescue the falsely imprisoned people in Arctic Mines when she receives a coded message from a friend and mentor, Juggler Vein, that contains vital information. Current world events once again inspire the plot for this graphic novel－such as fake news, discrimination, corruption, segregation, immigration regulations, and many more autocratic policies. Several new characters with more bizarre names are introduced in a tale filled with danger and deceit. With the help of her allies, particularly private investigator Posthumous Krill, protagonist Mary discovers new details about Dr. Creed and his investigations during Rump’s reign. Just as in the previous book, I had fun trying to decipher codes and clues before allowing myself to read their meanings. New readers of the series will find the format creative and eye-catching. This second volume can be read as a standalone, as there are enough references to the previous book. The politically charged views might continue to alienate some readers, but it’s thought-provoking to read and relate the judgmental and factious nature of the antagonists to the real world. Simply put, The Rescuer's Tale is a commendable continuation from Wilburn for this dystopian and dark fantasy series.